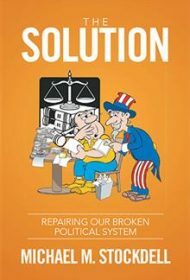 The Solution is a spirited and compelling look at what ails America and how to fix it. “I’m angry, really, really angry,” is Michael M. Stockdell’s passionate opening sentence. But instead of a fuming rant, what follows is an intelligent and informed discussion that’s an antidote for the blinding furies unleashed by today’s polarized politics. Stockdell variously challenges Meme Theory, big government, Civil Service, and the “high-minded,” “ideological” and “self-serving” beliefs that have led America into this mess, among other issues. Congress is a “disrespected joke,” he writes. The well intentioned but overreaching search for “comprehensive solutions,” he bemoans, explains so many failed government programs, such as the Affordable Care Act. Insights provided by his years as an Agricultural Department employee illustrate the inherent difficulties that stand in the way of government reform. The Constitution, he argues, fails to serve today’s needs and expectations. But this is more than a lamentation. Stockdell also proposes 18 Constitutional amendments that he argues will lead to a more efficient and truly representative government. Some are familiar, such as term limits and a balanced budget amendment. Some are imaginative, such as capping campaign expenditures instead of contributions. Some are more far-reaching, such as abolishing the Electoral College and electing the attorney general. Some might even be considered revolutionary, such as creating a fourth branch of government comprising professional administrators. Above all, he proposes a more citizen-friendly way to amend the Constitution. Stockdell considers himself to be “a peculiar bird who is a bit on the right and a little bit on the left.” But conservatives will feel more at home with The Solution’s outlook. Not that liberals shouldn’t read it; it presents the other side without the inflammatory mudslinging and personal attacks to which we’ve become accustomed. In short, The Solution is a fresh look that abounds with interesting remedies worth debating.